The Sacred and Secular: Does Christ Differentiate? Ultimately, this passage is about the supremacy—the authority and sovereignty—of Christ. He, as part of the triune God, is the creator and sustainer of all creation. That includes everything spiritual and physical, unseen and seen. All things were created through him and for him. All things find their end, their purpose, their goal in Jesus. Too often we separate life into sacred and secular compartments. We tend to see the spiritual things we do as being more important to Jesus. These verses remind us that as we respect and enjoy all that Christ has created, we honour and worship him. As we go about our day, working or playing—even doing our mundane chores—we are doing it for Christ. We tend to mainly focus on the spiritual when we think of the reconciling work of Christ. These verses remind us that Christ is redeeming all things. His death and resurrection are about bringing peace and healing to all of creation (and Isaiah 65 gives us a glimpse as to what this will ultimately look like). We are called to be agents of reconciliation which involves seeking to reverse the effects of what sin has sought to destroy—spiritually, physically, and relationally. This process of reconciliation is under way. It is not just some future moment in time when Christ returns. It is an ongoing process that we are called to participate in now, to live in the way that God intended for his creation. Yes, one day it will be fully realized. Yet in the meantime, it is up to us to make it tangible as we live as agents of reconciliation—offering a foretaste of what is to come. 1. What are the signs of a broken, sinful world in your community? How can you and your church community be agents of reconciliation in order to bring healing and restoration to the situation? 2. When you consider that all things—spiritual and physical—were created through and for Christ and that through his work on the cross all things are being reconciled or made right, how should this influence our actions and attitudes toward both the spiritual and the physical parts of creation? Noteworthy Resources: The Christian & Missionary Alliance is a member of the Canada Foodgrains Bank. CFGB offers a wealth of information related to creation care and how we can be involved in fighting global hunger. 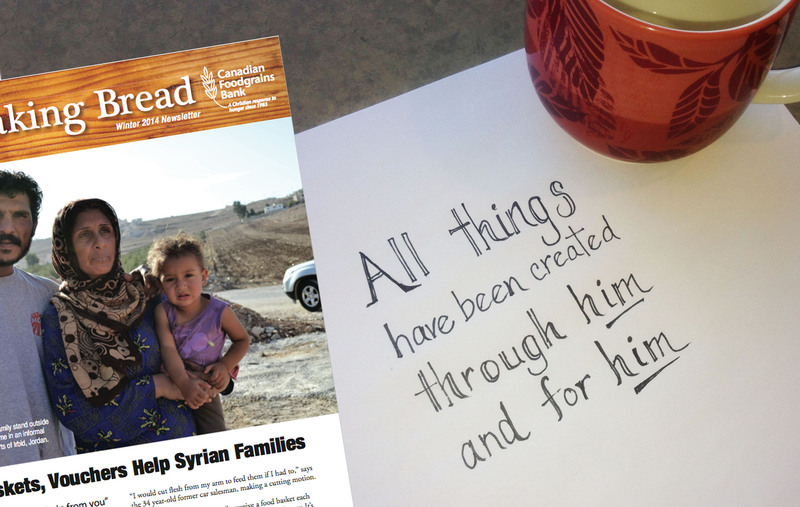 Watch this eye-opening video: Hunger and Climate Change and perhaps be inspired to start a harvest of letters campaign or make a designated donation to the Christian & Missionary Alliance in Canada’s Food Aid fund. You can also read about the current agricultural projects C&MA is funding.